The book has nine chapters, each dealing with a specific topic related to supervision and consultation practices and ethics. Thomas begins by reviewing the ethics codes of 15 major professional organizations within the United States and Canada. These ethical principles, standards and guidelines inform proper deportment of supervisors and consultants operating in academic, training and clinical services venues. 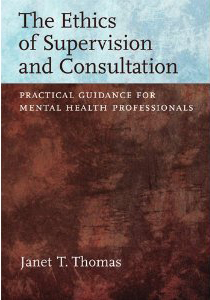 There are different models of supervision and consultation, several of them discussed in the book. No single model dominates professional practice nor do existing research findings unequivocally support one model over another. Thomas integrates case examples to illustrate how disparate theories of supervision and consultation are typically implemented in the face of unique ethical challenges. Among several thorny issues that can arise during supervision and consultation, Thomas highlights professional-personal boundaries, multiple relationships, informed consent, record keeping and power dynamics related to gender, race, ethnicity and religion. Again, she uses case examples to depict the fluid process of ethical decision making and resolution. And true to its title, the book gives good pragmatic advice and reasonable recommendations. “The Ethics of Supervision and Consultation” is an ideal resource for psychology, counseling, and social work graduate students. Indeed, the book could serve well as a primary text in ethics courses or clinical training seminars. Also, it should be considered essential reading for advanced trainees within mental health internship and post-doctoral programs. For practicing professionals, I can’t think of a more vital book to have in your library. James K. Luiselli, Ed.D., ABPP, BCBA-D, is senior vice president, applied research, clinical training and peer review at the May Institute in Norwood, Mass.